Join other attendees at lunch to share ideas, talk about the issues of the day, and maybe solve a few. 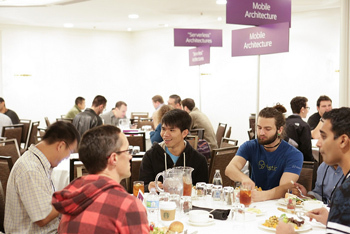 While you eat lunch, you can find and connect with other like-minded people at tables designated for certain languages, technologies, and interests. Look for the signs on the tables near the buffet lines each day. No advance signup is necessary. Not sure which topic to pick? Don’t worry—it’s not a long-term commitment. Try two or three and settle on a different tribe tomorrow.